Provide a flawless foundation application every single time With a concave design, which is perfect for you to apply liquid foundation on your face Ideal for professional or home use Clean 2 weeks 1 time. Baby shampoo or any low subsiding soap will work. Rinse well and air dry. Great for buffing and blending! Bristles are specially designed with goat hair and synthetic fibers to give you the perfect lightweight application. 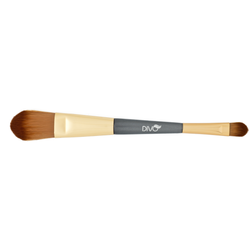 This flat-topped, full circular brush is used for lightweight application and blending of any formula colour – fluid, cream, powder or pigment. Ideal for creating soft layers or adding textures. This firm synthetic brush applies liquid or cream foundation smoothly over your skin for a polish finish you cant achieve with your fingers. Tapered to reach even those hard to get areas such as the inner eye and around the nose. 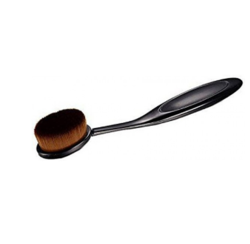 Made of soft nylon bristles for hygenic purpose, this foundation brush is especially designed for applying liquid or cream foundation evently, for a flawless finish. Multipurpose using for face makeup, Don't be arrested in the form. no-mess foundation application, directly from bottle to brush. This full tapered brush deposits just the right amount of foundation onto your skin. Perfect for a smooth flawless application. Materials: Nylon, Aluminium, Wood. Ideal for a precise draft of foundation with both fluid and compact creamy texture. Its special flat shape ensures a uniform and rapid application of foundation. This product is available for sale only in sets of 12 pieces. Vega foundation brush is designed to provide a smooth, even finish and flawless look. Used to apply, distribute and blend foundation into all areas on the face. A taklon-bristle brush for applying all of our Liquid Foundations and Shimmer Tints.